Caught off guard by the fact that it’s my turn to write a blog post, I’ve decided to write about the recents attempts we’ve undertaken at BAND for a shotgun wedding between Team Color Code and Team Marginalia. It all started when the Marginalia people realized that, Blake’s annotations being what they were, it was extremely confusing to constantly differentiate between which words were part of the original typographic edition and which were Blake’s comments in an .xml document. We thought it would be much less muddled if we could completely separate the typographic text and Blake’s hand in two distinct layers.For this purpose, TCC’s use of seemed useful, since it allows us to indicate multiple strata of writing in the same physical space. 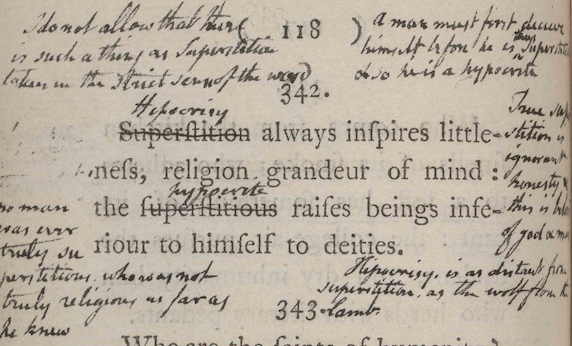 (For more on TCC’s use of – “Setting the stage, losing the line” http://www.19.bbk.ac.uk/articles/10.16995/ntn.728/) Unlike Blake’s letters and other manuscripts, The Four Zoas and the marginalia share another feature – the text is not written in one large block but in (sometimes) discrete chunks on various parts of the page. This favored the use of , so that we could separate out different comments based on where they are placed on the page. So, to decide whether these two teams could harmoniously share these new tags, we had a meeting. It was crowded, loud and enthusiastic, and Morris and Anna couldn’t even fit inside the room. I think the whole department realized that something important was going on.The following are a couple of things we solved and some new problems we had as a result. Eric suggested that since TM’s use of was significantly different, we could use and to designate the two kinds of text. This works wonders, since now we have a better way of identifying the stages than the vague and . But, as Eric also pointed out, in order to use the term, we would have to be consistent with TCC”s use . Thus, if Blake crossed out a line of annotation and rewrote it, we would need an additional stage for that line. How would we fit that into the new TM schema? What would we even call it? We decided that we would use for the typographic text in the first stage, and use the necessary zones (header, footer, right margin, left margin and textblock) depending on where the comments are placed in the annotation stage. While that worked well for most of the documents, Blake’s comments often crossed over zone boundaries and upset all our plans. We’re still figuring out what to do next. As Shannon said, I’m under the oath of strictest secrecy to divulge our current plans, but I’m sure the next blog posts will reveal a little more of what we’re up to. Pingback: Bringing Together Team Color Code and Team Marginalia | Uncategorized | Aggregated blogs on Romantic Studies - please click through to read full posts.